Domestic workers have closed their first collective wage negotiations in a historic agreement at the Employment Ministry, achieving a pay increase of 28%. Seven domestic labour unions signed the agreement with counterparts from employer associations on Tuesday, making this the first bilateral agreement of its kind. 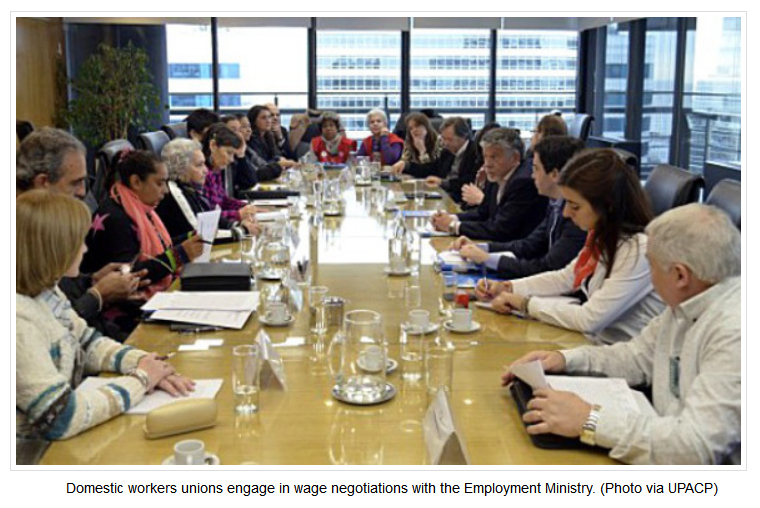 Negotiations between labour unions and the Employment Ministry began at the beginning of this month. Also in attendance were representatives from the ministries of Economy and Social Development. The pay rise will come in two installments, with a 21% increase payed retroactively from the start of this month, and a further 7% increase on the original salaries coming into effect in December. “The important thing is that the further 7% will be payed this December and not in January 2016 so that it can be taken into account for bonuses and holiday pay,” explained Carlos Brassesco, lawyer for the Union of Domestic Workers in Private Homes (UPACP), the largest of the seven labour unions that took part in the negotiations. The agreement affects five official categories of domestic workers, which include maids, childminders, non-medical carers, housekeepers and caretakers, among others. The hourly wage of live-out general domestic workers will rise from $33 for the month of August to $40 for September, and to $42 in December, constituting a standard monthly increase of $1,172 pesos by the end of the year. Housekeepers will also earn $10 more per hour, while live-in carers will see their wages rise by $11 (from $40 to $51) between August and December, equating to a 1,452 peso increase per month. The agreement will be put in effect throughout the country between September 2015 and August 2016.